Another Kentucky Derby (G1) prep, another upset on Saturday as champion juvenile and odds-on favorite Good Magic went down to defeat in the $400,000 Fountain of Youth (G2) at Gulfstream Park to Promises Fulfilled, who came out running from post 10 and led the field wire-to-wire for owner Robert Baron and trainer Dale Romans. 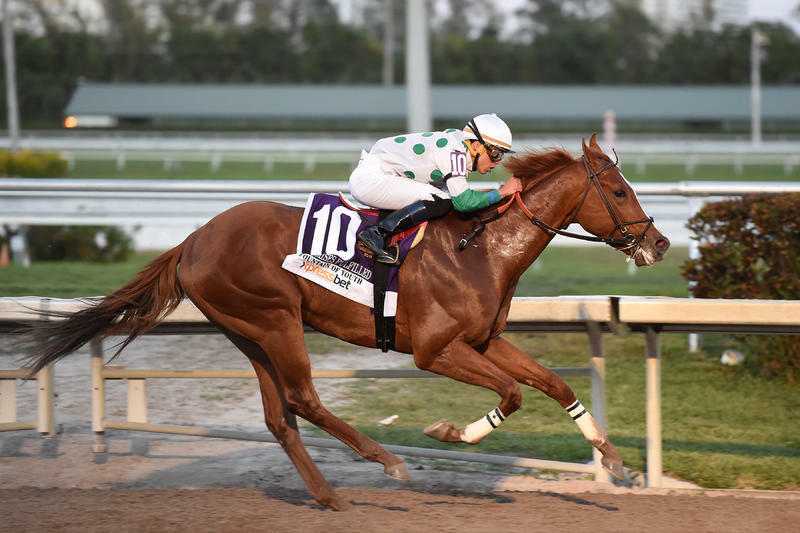 Guided by Irad Ortiz Jr., Promises Fulfilled, a son of Roman's Preakness (G1) winner Shackleford, set a pace of :24.57, :48.96, and 1:13.80 while being chased by second choice Strike Power. Those two would run one-two throughout the 1 1/16-mile journey, with Promises Fulfilled winning by 2 1/4 lengths in a time of 1:44.17 over a fast track. He paid $38.40. "I thought that he could open up, and he did. It was a bunch of fast horses, but a lot of times that speed doesn't materialize and coming from the outside it kind of pressed our hand," Romans said. "They let him go in 48 with his ears up and I knew it was going to take a heck of a horse to pass him at that point." Strike Power, making his two-turn debut following a score in the seven-furlong Swale (G3) last month, finished 2 1/4 lengths ahead of Good Magic. "The horse came back a little tired," said trainer Chad Brown of Good Magic. "He was blowing pretty good. It looked like he needed the race. Hopefully, he got what he needed out of it and go on to the next step." Machismo was fourth, and was followed by Marconi, Gotta Go, Storm Runner, He Takes Charge, and Peppered. Free Drop Billy, who might have started as the second choice, was scratched by Romans in favor of next week's Gotham (G3) at Aqueduct. "The owner and I made the decision [to scratch Free Drop Billy]. He's already a Grade 1 winner, and we just wanted as easy a race as we can get going into the last round of preps so we decided to go the New York way. This race looked like it was coming up the toughest of the year, and I think it did. It was just a strategy play." As part of the Road to the Kentucky Derby series, Promises Fulfilled earned 50 Kentucky Derby qualifying points for the win (for a current total of 52), virtually assuring him a spot in the starting gate at Churchill Downs. Strike Power earned his first 20 points, while Good Magic's 10 points increased his total to 34. Machismo earned five points. A four-length debut winner at Churchill Downs last September going six furlongs, Promises Fulfilled also led wire-to-wire in winning a seven-furlong allowance at Keeneland the following month. His stakes debut, in the November 25 Kentucky Jockey Club (G2), was a good one as he led most of the way before fading to third behind Enticed and stablemate Tiz Mischief. He's now earned $327,280. Bred in Kentucky by David Jacobs, Promises Fulfilled was a $37,000 Keeneland September yearling. He's out of the Grade 3-placed Marquetry mare Marquee Delivery, making him a half-brother to multiple stakes winner Marquee Miss and the the stakes-placed Marquee Cal Gal.